Parkopedia allows people to find the cheapest and most convenient parking available, no matter where they are or where they are going. 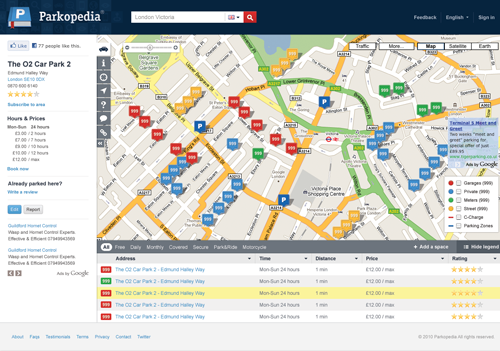 Users can contribute information about street parking, parking meters, car parks and even private driveways that are for rent. They are crazy about parking and it was our job to be the same after they approached us looking for a long-term design partner to work on their brand and website with mobile applications to follow. We created a refreshing new brand identity that encapsulates the concept perfectly and worked closely together to solve a number of key problems on their existing site. After working through the UX and UI design we delivered key front-end HTML/CSS/jQuery templates to their development team. 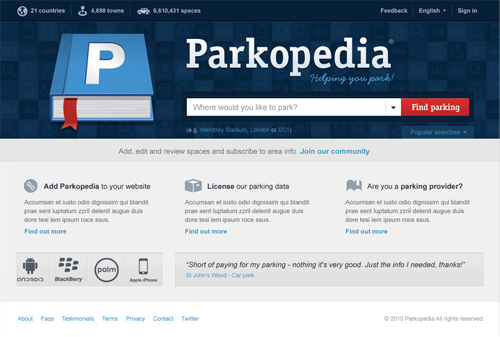 Parkopedia have the world's largest user-generated parking database, with over 25 million+ spaces in over 27 countries we’re delighted to be on board with their small team as the business grows. Supereight have delivered on time and budget a beautifully designed site which we are very pleased with.